Along with our excellent senior home care, Visiting Angels eliminates the stress and worry family members are experiencing over the care of their elderly loved ones. Seniors are also comforted and feel at ease knowing that a caring Visiting Angels caregiver will be there to assist any time, day or night without changing their routines. To learn more about how Visiting Angels’ senior home care services can work for you, fill out our Information Request Form below or contact us directly at 1-800-365-4189. Research your options now so you are prepared to help your loved ones when they need it! We'll send you periodic updates about resources designed to help your loved one live at home. Visiting Angels is the nation's leading, nationally respected network of non-medical, private duty home care agencies providing senior care, personal care, respite care and companion care to help the elderly and adults continue to live in their homes across America. Studies have shown that seniors thrive more when living in their own home than in a nursing home. 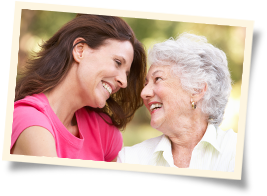 Help your elder relative maintain their independence by asking for information today! Many Visiting Angels® Agencies offer specialized care for clients with Alzheimer’s and other illnesses. To help us to better serve your home care needs, you can provide additional information about your loved one's needs.